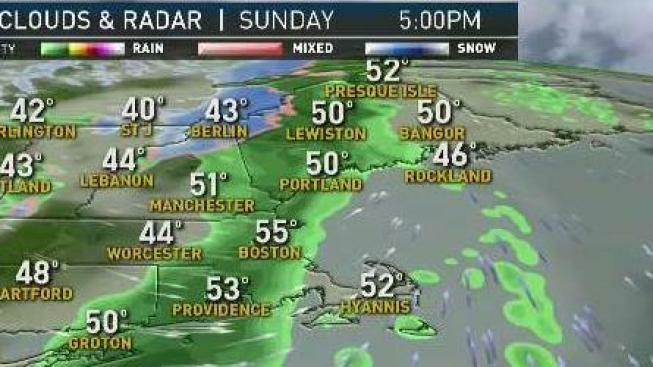 From the NBC10 Boston Weather Center… Sunday: Clouds thicken, period of afternoon rain. Highs around 60. Sunday Night: Skies clear. Lows in the 30s. Monday: Sunny and breezy. Highs in the 40s. Cape Cod: Sunday: Mostly cloudy, late day showers. Breezy. Highs in the 50s to near 60. Sunday Night: Rain ends, skies clear. Lows in the 30s to near 40. Monday: Sunny and breezy. Highs in the 40s. Today will get off to a warm start, but temperatures will drop with gusty downpours during the afternoon. Before the front rolls through, temperatures will reach the low 60s, especially in eastern New England. Monday will be sunny and a touch chilly. High temperatures will only reach the mid 40s. We gradually warm up going into the day on Tuesday. It will be a week were temperatures along the coast will only be in the mid to upper 40s and inland in could be closer to 60 degrees. Showers are possible Wednesday and again on Friday. It appears most of that activity will move out in time for the weekend. An early call – Sunday will be the pick of the two weekend days next weekend. Following next weekend, it should be fairly dry, quiet and seasonable. Stay tuned!